Unquestionably, red is an energetic, brilliant, breathtaking color that can lend even the dullest space a spectacular look. In the last decades, when interior designers work predominantly with light, neutral tones, red is used as an accent hue. However, in bathrooms, this vivacious color can go beyond simple accents to transform the space into an elegant, glam one. 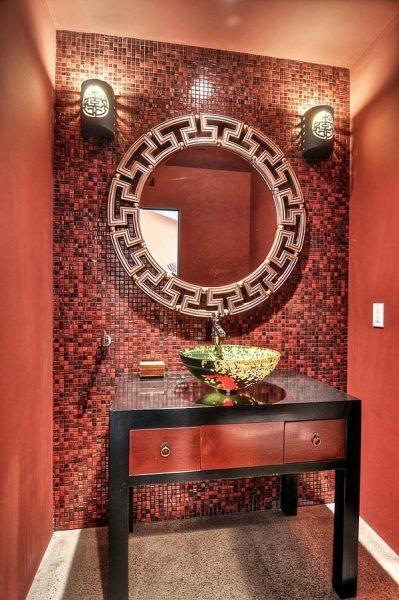 Although using red in other rooms can be tricky, bathrooms seem to be the place where red works perfectly well because you can always incorporate red tiles. Whatever their size and style, amazing bathrooms with red accent walls, ceilings, or other accents steal the show. 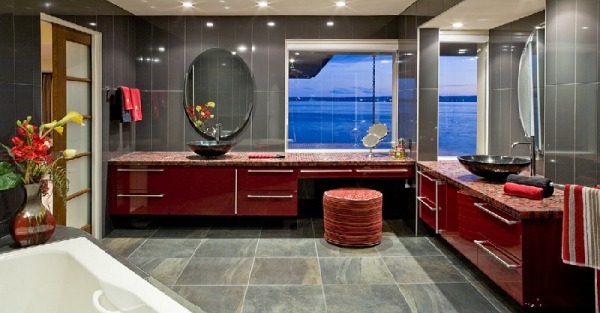 Enjoy some truly fabulous red bathrooms! 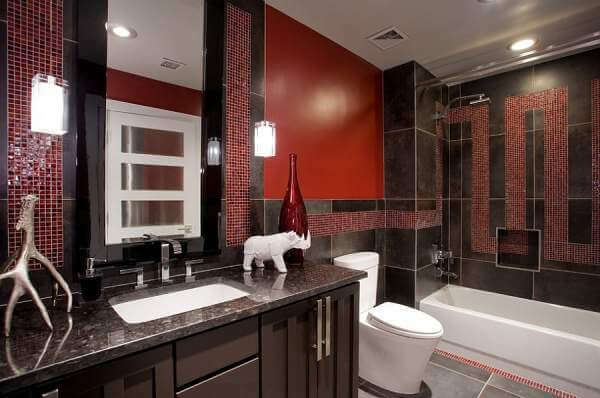 If your master bedroom is in red, adding the same color to the adjacent bathroom definitely makes sense. 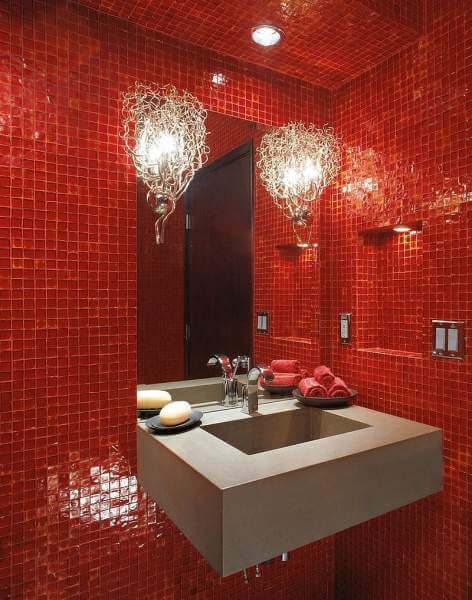 When using red as a dominant color in the bathroom, plan carefully the lighting scheme. With such a vibrant color, you need lighting that eliminates dull corners, and this is especially true for small bathrooms and powder rooms. Complementing red, shimmering silver acts as a reflective surface and lends the bathroom an airy, elegant look. Being a versatile color, red works well with almost any style. However, the finish you choose often makes the difference. While glossy finishes are used in retro, minimal, and contemporary styles, matte finishes are an option for rustic, Mediterranean, and traditional settings. 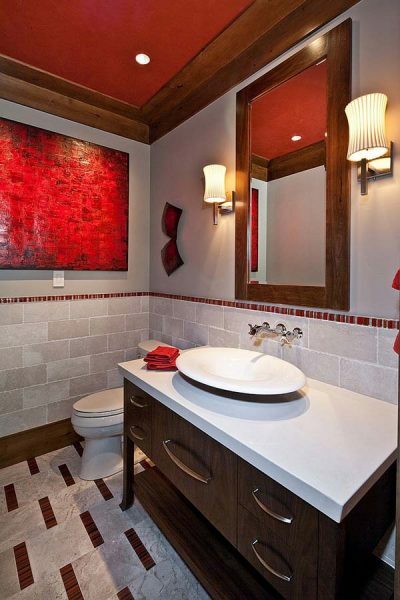 However, if you look for an alternative to tiles, painting the ceiling red will lend a daring look to your bathroom. Being a versatile color, red works well with almost any style. However, the finish you choose often makes the difference. While glossy finishes are used in retro, minimal, and contemporary styles, matte finishes are an option for rustic, Mediterranean, and traditional settings. As red and black make a timeless combo, black is almost always the ideal complementary hue. For a more cheerful look, a red-and-yellow combo is an appealing option. 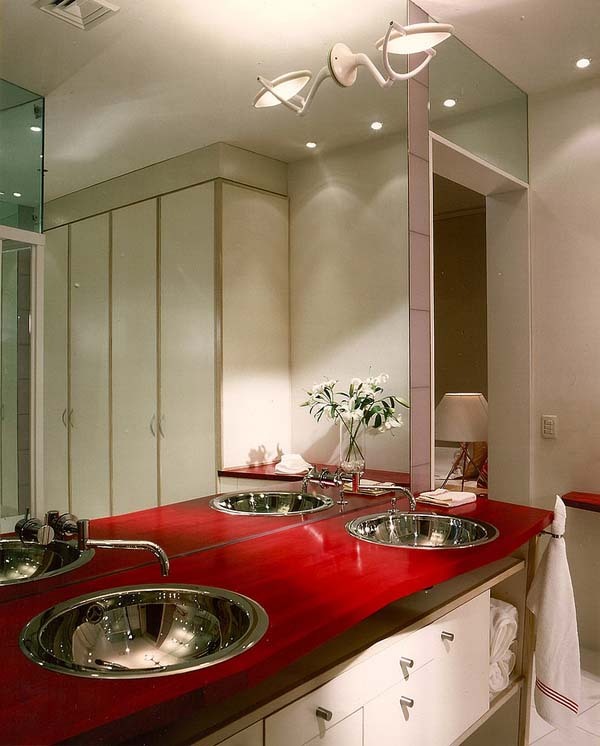 If you are afraid to fully commit to red, adding red accents to a bathroom with a neutral color scheme is not a difficult and expensive task.